The Princess Evelyn mixed an illegal love potion with unintended disastrous effects. A Wilde Hunt is called to find a cure for the princess and save the kingdom. Samantha Kemi, who inherited a talent for mixing potions answers the call and teams with their family’s Finder who travels the world seeking rare ingredients. Their direct competition is the father/son team who reportedly cheated Sam’s family during a previous Wild Hunt by developing a synthetic potion. To complicate things, the son is the dashing Zain, reported boyfriend of the princess, the intended victim of the love potion gone wrong. Also in the race is the evil exiled aunt of the princess who is determined to win the hunt and takeover the kingdom. The hunt for the rare ingredients takes them into dangerous regions and of course, Sam develops feelings for Zain. Danger abounds at every turn and the race to save the princess appears doomed. Samantha is a fun heroine and Zain plays a good role but it is resourceful Kirsty the finder who is intriguing. There hopefully a story to come about her past adventures. And Sam’s little sister, Molly, is brave and wise beyond her years and still developing her magic. 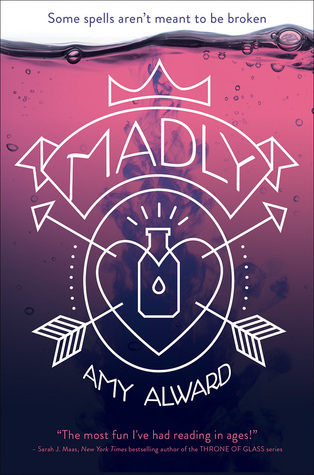 Madly is the first in a planned series and should be very successful. I look forward to reading the next in the series. Highly recommend! This entry was posted in adventure, fantasy, highly recommend. Bookmark the permalink.